This article was originally published in Drones Magazine April/May 2016 issue. In this month’s installment we look to our latest adventure and newest video project for some tips that can help you out when flying from a boat. We will look at some pointers specifically tailored to sailing but that can also be applied to any boating situation. 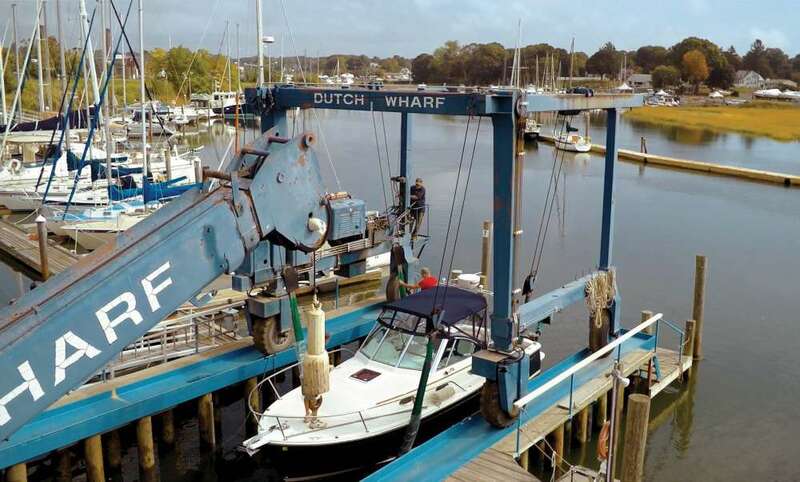 We cover a wide range of applications but when we were first approached by Dutch Wharf to document their marina and wooden sailboat building services we were pretty excited. We knew this would lead to some action out on the open water and a chance to shoot some very historic boats. 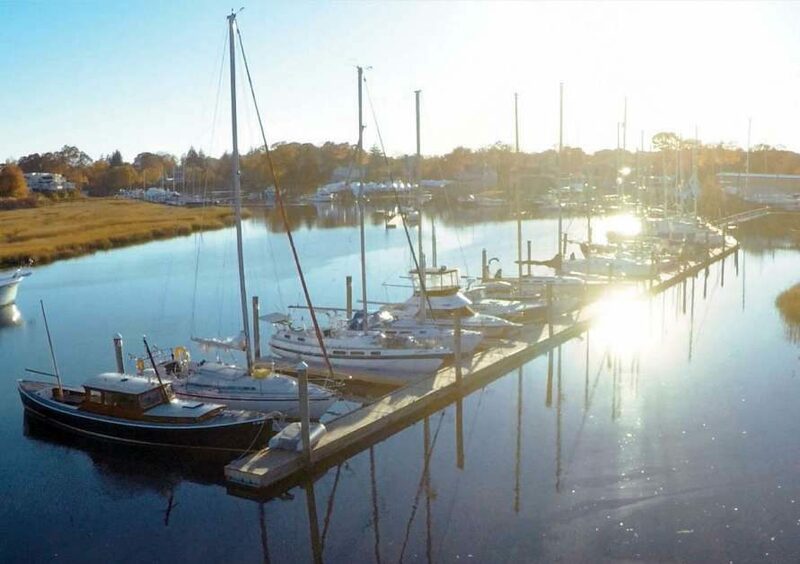 Our task was to capture the beauty of some of the boats that are master crafted and restored at a boat yard located on the Branford River in Connecticut as it feeds into the Long Island Sound. We were met with a very welcoming and enthusiastic group about the project but they had yet to work with multirotors so it allowed us to really educate them correctly and explain the capabilities of what we can offer. 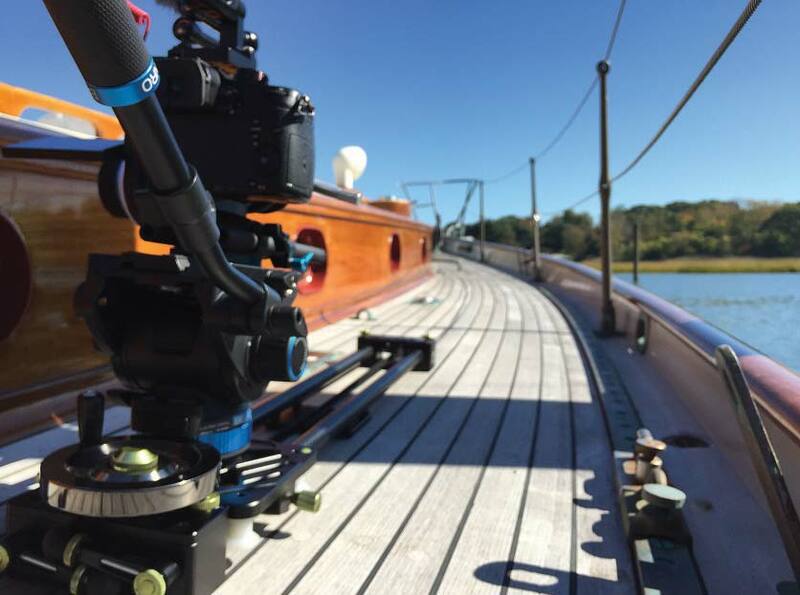 Our project would also cover the basics of the services used to repair the fine wooden yacht and the finished project would incorporate the ground work with our DJI Ronin and aerial work from the sky as shot on an S900. After we got our storyboard lined up and the client’s needs ironed out into a shot list it was time to get started with the video work. a factor as well. If it is set at 1500m meters for example, you could run past that rather quickly if traveling on a boat at a good speed. When you hit that mark your multirotor is going to stop and try to return to your home point. If that home point was a hand launch from the boat over the water you have problems. Check inside your software assistant and make sure you know what settings are applied to both return-to- home and distance limit. Newer DJI Inspire and Phantom firmware allow you to use a dynamic home point if using a GPS based device like a mobile phone. If you have a signal out on the water and are confident you can use this system in case anything fails and at least get the multirotor close to the boat. Since any signal failure can put the drone into some type of safety mode make sure you have practiced and know how to recover from any autonomous mode back into full control. Being able to do this before you are tested over water will really help your confidence and ensure safe piloting. Before heading to sea to get our boat shots we grabbed some b-roll and had some fun flights in between boats at the marina. 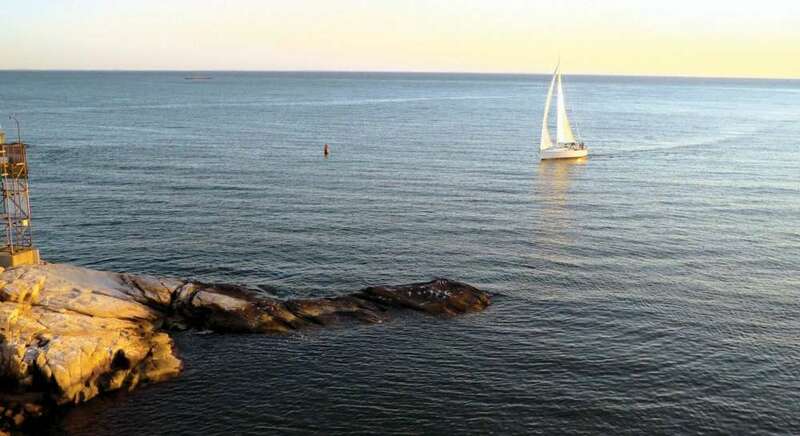 If doing anything low altitude near sail boats you want to track out over the water to be certain you don’t get close to any expensive property and run the risk of hi ing a mast. A safe bet is to eye up the highest mast and fly above that. If working between boats or getting into dynamic shots use a two-person pilot/camera operator or employ a spotter to help keep an eye on your drone while getting some shots. If you are on a boat chances are things can get wet. Start by making sure you have all your LiPos in a watertight case or at the very least plastic bags to avoid getting any water near the connections. Next be sure everyone on the boat knows what’s happening. Talk with the captain of the boat and figure out what your plan is. Know how you will communicate, launch the drone, and retrieve it. Have a backup plan in case the captain needs to alter course for safety and plan things out in advance. Also do not fly your batteries as low as you normally would, leaving some extra time if needed since you can’t just land at a specific moment. Always think safely and be respectful to everyone on the ship. You have two options when it comes to launching the multirotor from the boat. One would be to completely stop the boat and the next is to have the captain slow the boat down and then launch by hand. 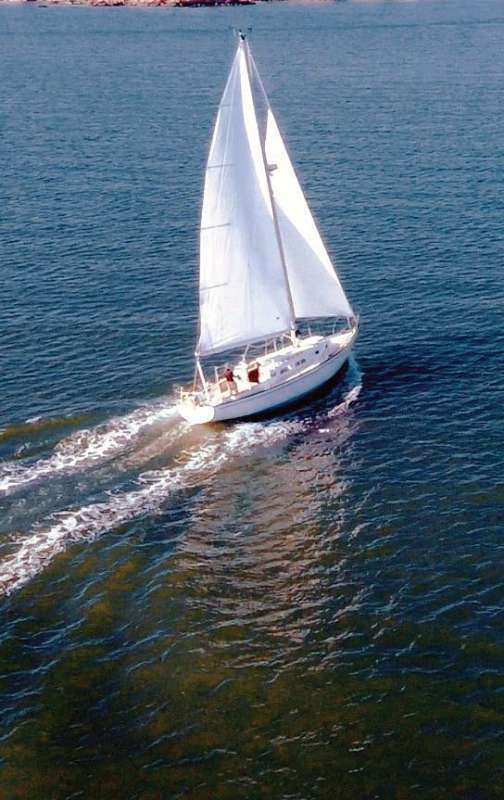 When on a sailboat you can turn the boat to a direction that heads into the wind and then have the vessel turn to regain the wind at its back to start moving. Be aware of which direction it will tack and get the drone out of the large mast in case of any quick change in direction. It’s always best to fly backwards and away from the stern of the boat and give a good buffer before the boat is underway. Sometimes the bow of the boat will be a safer bet but it entirely depends on circumstance. This is why it is crucial to plan things out prior to takeoff. We opted for a DJI S900 and A2 flight system built by Aerial Media Pros and outfitted with a Panasonic GH4 for this shoot. Now that you’re up in the air it’s time for the fun part of capturing some shots that can show the perspective only a multirotor can. First cover some basics and get some tracking shots of the boat from both sides. If you are confident flying backwards or running dual operator gain some speed and get in front of the boat and aim the camera in reverse. When it comes to pulling this off, to get ahead of the boat gain your distance to the side and then move into the path of the boat. Rather this than run the risk of the boat going faster then you can fly and having the mast run into the drone. Some other interesting shots can be had by framing the boat and then gaining altitude to reveal the landscape or shore if you are close enough. If flying with lots of sunlight, remember that on a 40-foot boat with a massive sail you are bound to get some interesting shadows. Try doing a shot that aims straight down or at a similar angle and let the shadow come into frame before the boat does. Another one of our favorites is to fly behind the boat and fame just the ocean and wake from the boat and then gain altitude to reveal the ship. Have fun trying out different shots but make sure to keep your orientation and only cross in front of the boat or traverse the boat path if you are higher than it is or you will run the risk of clipping the boat mast. With most boats having sails and other components that gravitate towards white you need to be mindful of your exposure. Using a neutral density filter can help keep balanced exposure and a circular polarizer filter can help take the glare out of the surf and act just like your polarizing sunglasses out on the water. Play around with both and see what works best. If using a camera that is not in automatic you will find a drastic difference in exposure when you change direction and camera angle. If you can’t adjust the settings remotely you might opt to plan for all the shots with the camera in one direction and then land, swapping battery and settings and move on to tackle the next set. When it comes time to land, this can be a stressful situation your first few times so take a deep breath, think things over and make sure you have a predetermined plan as well as plenty of extra power left in the batteries. If the boat will come to a complete stop notice the direction the boat will continue to drift and bring the drone in from the opposite side. Take it nice and slow and figure out where you will land. If you are having an assistant catch the multirotor make sure you have clear communication so you can cut the motors the second they tell you they have contact with the unit. 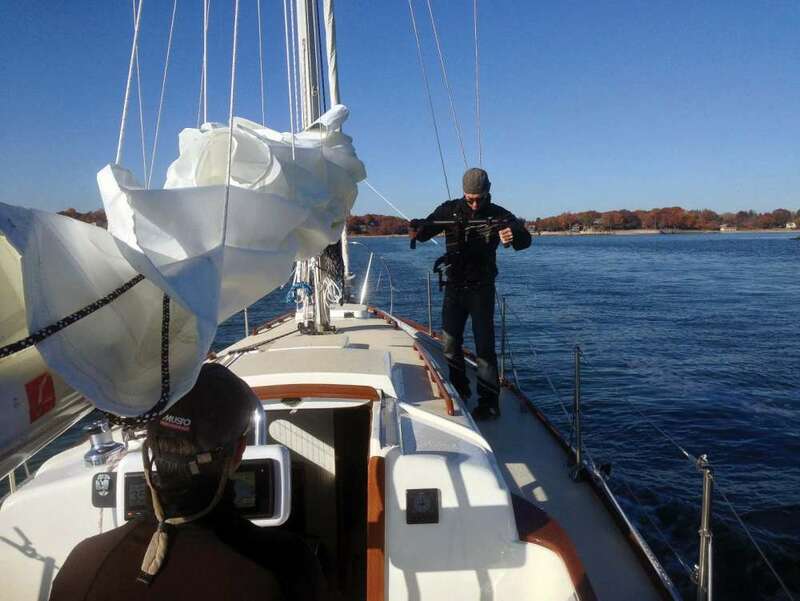 If you are on a large sailboat that can only slow down to a crawl you will need to fly the drone in from the back of the bird and go for a hand catch. When we are using a larger copter carrying a full-size DSLR we opt to have someone hand catch it and then a spotter for that person to help them balance and lower the unit. Always think about safety and if the wind picks up or you are not self assured on your approach to the stern of the boat back off and try again. We hope you have enjoyed these tips and encourage you to fly safe when operating from a vessel. You can get some amazing video and photos out on the water and we encourage you to try for yourself once you have the confidence to do so. Happy flying! For more information visit us at www.mikested.com and www.visionaerialmedia.com. Want to see the finished boat project video? Stay tuned to the digital edition of Drones magazine to see the finished video. Next Connex Announces HD FPV System!